It’s been three and a half months since I’ve reviewed a ballpark for this series, but having been to only 7 active MLB parks, I didn’t want to rush through this series faster than I could see new venues. But yesterday, I finally got around to something I’ve been thinking about for a while: I built a database of every MLB and MiLB stadium to help track my progress as I make my quest to visit them all. This rekindled my interest in this series, and here we are. PNC Park is an incredible stadium. Setting aside Comerica Park for personal attachment reasons, PNC my favorite park by far. It is scenic without being too ornate as to distract from the actual game and has solid dining options. The view of the river, bridges, and Pittsburgh skyline is excellent and foul territory is scare enough that you’re very close to the action even when your seats aren’t great. I’ve been to three games there and sat in the upper deck twice and lower deck once. From behind the plate in the upper deck, you were still right in the action and had almost every inch of the field in view. From the lower deck, you have good angles pretty much anywhere you sit. Not only is left field an interesting size, but the right field wall is a throwback to the old school scoreboard and the tantalizing hope of seeing a ball fly into the river keeps fans coming back. Ticket and food prices are generally pretty reasonable and the food and beverage selection is diverse and tasty. I’ve had standard hot dogs, fries, and chicken strips, all of which were above average for ballpark food. Another thing I like about PNC is its location. It’s on the north side of the river near a couple museum, casino tourist attraction type places along with some very nice hotels, but it’s only a short walk from the more typical Pittsburgh downtown area. Not only is the park a fun place to be, but it’s generally a nice area to hang out in before they open the gates and after the final out. 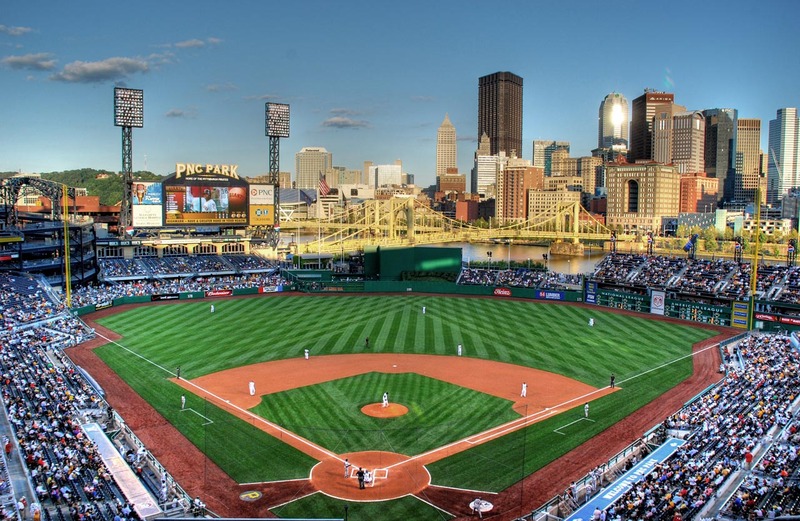 I consider PNC the standard by which all other parks are compared as it has the view and amenities of a big city park with the close to play feel of a minor league stadium. It’s simply an excellent place to enjoy a game and is a must visit for all serious fans. I’ve previously rated Nationals’ Park, giving it a 7 out of 10 relative to its contemporaries (minor league parks and MLB parks are only compared to other parks at their levels) and PNC clearly sets the curve at 10. The only complaint you can have about PNC is that the Pirates play there, and even they have turned themselves into a watchable club. I completely agree. I was there on August 3, 2002. The park looks great during the day and even better at night.